Hi there dear friends!!! I am in heaven right now!! 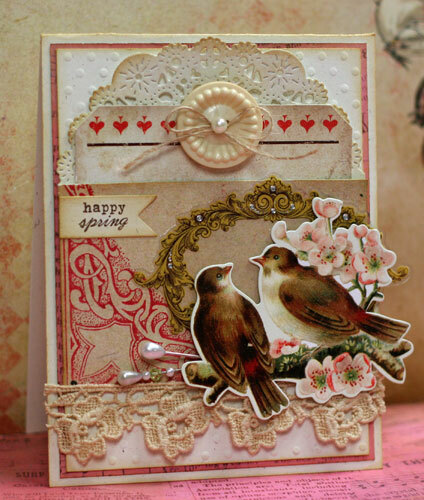 Not only is it spring, but it's spring with a vintage twist-Glitz Style! 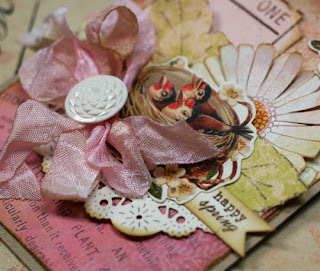 I am so in love with Glitz Design Afternoon Muse papers and goodies!! The colors are gorgeous, the stamps are fantastic, and all the elements are absolutely amazing!!! In the first card, I used Glitz Design Afternoon Muse Stamps, Whatnots and Glitzers to inspire my card!! Isn't the corner stamp simply amazing??? So very vintage! 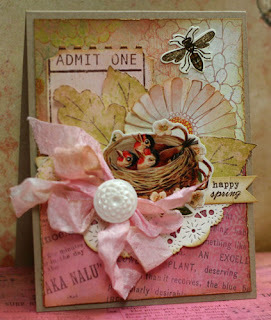 I will be using the Afternoon Muse stamps quite often I'm sure! other supplies: Papertrey Ink: vintage cream cardstock, Tag-its #2 stamp set, button twine, and Parisian doily die; Prima lace; Jenni Bowlin button; Making Memories Stick Pins; Kaiser Craft Pearl; Pink Paislee Ephemera. In the second card I fussy cut some floral images from the Afternoon Muse Floral Paper and added a Whatnot Ticket to the collage. I just love the vintage feel to this whole collection and I know I won't grow tired of playing with all the goodness and warmth it brings!! Other supplies: Papertrey Ink: vintage cream and kraft cardstock, Parisian doily die,Tag-Its #3 stamps; Ribbon: MemrieMare; Pink Paislee Ephemera; Button from my stash. 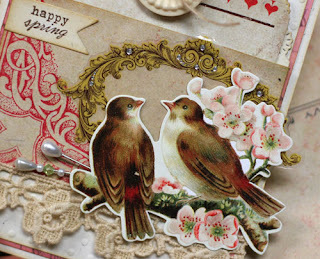 As you can see, I am totally loving this Collection from Glitz Design. Next up Love Games and Laced with Grace!! Both lines are equally amazing and I am looking forward to playing with them!!! Thanks for stopping by and I hope you have a very Glitzy Day! WOW, Kristii, these are beyond amazing! I'm in love with this new line and you totally rocked it!